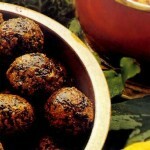 Baki Koufta are an Armenian food recipe of wheat balls stuffed with peanut butter. For the filling, put onions and water in a saucepan and cook over medium heat until onions are soft. Strain onions and set aside to cool, reserving water for koufta mixture. Add the parsley, basil, peanut butter and tahini into the cooled onions. 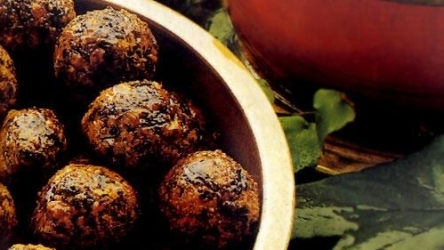 For the koufta balls, blend chickpeas in a blender or a food processor. Add semolina, bulgur, salt, pepper, reserved onion water, and 1 cup water. Set aside for 30 minutes for grains to absorb the moisture. Remove mixture from processor. Knead with wet hands until mixture holds together firmly. Form a small ball from a handful of the mixture. Press your thumb into the ball to make a cavity, leaving a wall about 1⁄4-inch thick. Place a spoonful of filling into the cavity. Close the cavity by gently pushing the sides together. Be sure the filling is completely sealed. Smooth the surface of the balls. Bring water and salt to a boil. Gently slide 6 balls into boiling water, and return water to a boil. Reduce heat, and simmer koufta for 10 minutes or until they rise to the surface. Remove them carefully and continue cooking the rest. Make sure not to break the shells, or the filling will spill into the water.